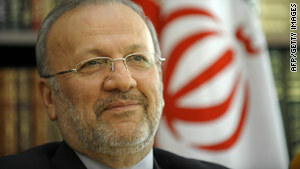 Iranian Foreign Minister Manouchehr Mottaki says Iran wants to restart talks on a nuclear fuel exchange. Istanbul, Turkey (CNN) -- Iran has offered to restart limited talks on a proposed exchange of nuclear fuel after Sunday talks with Brazil and Turkey over Tehran's nuclear program. Foreign Minister Manouchehr Mottaki said the Islamic republic plans to send a letter to the International Atomic Energy Agency, the U.N. nuclear watchdog, on Monday with the proposal. "And then we can immediately start negotiation for the details of the exchanging of the fuel," he told reporters after the lunchtime meeting with diplomats from the three countries. Sunday's hour-long talks, held at a posh hotel on the banks of the Bosphorus, in Turkey, are aimed at rebooting stalled negotiations over Iran's nuclear program. It was the first time officials from the three governments had met since they signed an atomic fuel swap agreement in May, which was criticized by Washington and other permanent members of the U.N. Security Council. Under the proposal, Iran would send 1,200 kilograms (2,640 pounds) of low-enriched uranium to Turkey in exchange for 120 kilograms (264 pounds) of 20 percent enriched uranium provided by Western governments. "All the details how that exchange should take place will come out through the discussion and talks in Vienna," the home of the IAEA, Mottaki said. But broader talks would have to wait until after the Islamic holy month of Ramadan, which ends the second week of September, he said. Turkish Foreign Minister Ahmet Davutoglu said after the talks that he hasn't seen the letter Iran plans to send. "The important thing is it is a positive response. The Iranian side said they will give a letter to start negotiations," he said. Iran has so far rebuffed international demands that it halt its uranium enrichment program, insisting it wants the nuclear fuel for peaceful uses. In low concentrations, enriched uranium can be used to fuel civilian power plants -- but it extremely high concentrations, it can be used to produce a nuclear bomb. Iran announced in February that it wanted to produce enriched uranium at a 20 percent concentration for use in a medical research reactor. The United States has accused Iran of working toward nuclear weapons, while the IAEA has called for increased safeguards at the Iranian enrichment plant at Natanz to ensure it is not concealing nuclear material. Last May, the leaders of Brazil, Turkey and Iran appeared to catch Western governments off guard when they met after marathon negotiations to sign the "Tehran Declaration." Despite the agreement, permanent members of the United Nations Security Council pushed forward with a fresh round of sanctions to punish Iran. Brazil and Turkey, who hold temporary seats on the Security Council, broke with their traditional western allies and voted against the sanctions. "We think we gave an important contribution to trying to solve a very difficult problem," said Brazilian foreign minister Celso Amorim, before meeting with his Iranian counterpart. "We don't have a big economic stake in Iran," Amorim added. "We were trying to help with world peace." Sunday's tri-partite meeting appeared to be aimed at reviving the proposed fuel swap and at starting a fresh round of talks between Tehran and its Western rivals. Turkey's foreign minister, speaking on behalf of Iranian foreign minister Manouchehr Mottaki, said after the meeting that Tehran was ready to resume negotiations with the European Union's foreign policy chief, Catherine Ashton. Both Turkey and Brazil insist they are impartial mediators when it comes to the international confrontation over Iran's nuclear program. "We have always encouraged Iran to take a flexible position," Amorim said. Davutoglu added, "Turkey is the only neighbor of Iran in the U.N. Security Council and Turkey is the only neighbor of Iran who is a member of NATO and western alliance as well. We will be affected negatively or positively by every development." Turkey's trade ties with Iran have been growing in recent years. On Thursday, Iranian and Turkish officials signed a $1.3 billion deal to construct a new gas pipeline between the two countries.